The Broadway play based on John Steinbeck’s classic novel started its preview screenings on March 19th at the Longacre Theater in New York City and opens officially on April 16th. The show boasts two pretty big Hollywood stars: James Franco and Chris O’Dowd. So, is the show good? 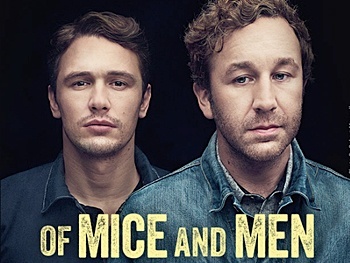 Well…Of Mice and Men is a nearly perfect theater experience. The story, for those who do not know it, is about two men who find a farming job in the area of Salinas, California in the 1930’s and what happens from there on. One of the men, George, is a tough-skinned drifter who cares for the other man, Lenny, who is mentally handicapped. The story is about their time on the farm. For those who have read the novel, this is a very, very faithful adaption and fans will enjoy it. For those who have not read it, the play is still fascinating. To start off, the acting in this show is absolutely incredible. Although James Franco is not even the best performer in the show, he pulls off something very impressive; he makes the audience get over the fact that he is James Franco and delivers a great performance. Within a few minutes of Of Mice and Men, Franco IS his character, George Milton. He nails the accent, the mannerisms, the 1930’s look and mentality of a drifter looking for work. It is also important to add that not once did James Franco over-act. His interactions with Chris O’Dowd are also excellent. I was very impressed by how convincing James Franco was, and this show reaffirmed how good of an actor he is. But the real star of this show is Chris O’Dowd. The British actor has appeared in movies such as Bridemaids and Thor: The Dark World, recently gaining recognition as an actor. James Franco does a great job as George, but Chris O’Dowd is a living and breathing incarnation of Steinbeck’s Lenny Small, a simple minded giant with a love for soft things and rabbits. Although Of Mice and Men‘s representation of the mentally handicapped may be debated these days, Chris O’Dowd really picks up the mannerisms and speech impediments of Lenny. As I write this, the show ended about 6 hours ago, but it is still lingering in my mind how good O’Dowd was. His performance as Lenny was how I imagined Lenny while reading the book. Besides the two leads, the rest of the cast is equally excellent. One surprisingly good performance came out of Gossip Girl’s Leighton Meester. I did not expect much of Meester, but she was really impressive. She does a great job of portraying the wife of the farm boss’s son. She plays the character like the character from the book but even adds a little bit of extra dimension to the character. You feel a bit more sympathy for the character than you do in the book. Another character that, at least I thought, was given more dimensions was the character of Slim. Slim is one of the farm’s workers and he is played by Jim Parrack, who interestingly has starred in almost of the films directed by James Franco. You get the sense in the play that Slim is a more kind hearted character than the book shows you. Parrack, Joel Marsh Garland, and James McMenamin deliver very good performances as the ranch-hands and Jim Norton delivers an especially tender performance as an elderly ranch-hand named Candy. Alex Morf also delivers the role of the boss’s hotheaded son, Curly, very well without overacting. Also, Ron Cephas Jones is also note-worthy playing Crooks, the black stable hand. One thing that also enhances the acting is how interesting and multi-layered each character is. The set and theater effects are also spectacular. The show features only four sets; a clearing overlooking a mountain, a bunkhouse, a stable, and Crook’s personal quarters. Only four sets sound simple, but the four sets are very detailed – from a clouded jar on a counter to a shelf full of books – and convincing. The design really fits the time period of the show and they are well made but not visually distracting and complement the story very well. Although not really a prop, Candy’s dog is actually played by a real dog (which was very well trained) and it added authenticity and heart to the eventual fate of the dog and the character of Candy. It is very important to add that this show is one of the best adaptions of a novel I have ever seen on either stage or film. Not only does it take the events of the novel and portray theme truthfully but the themes of companionship, loneliness, social ranking, social expectation, and the dreams all men have are all translated excellently to stage. As an example, in one scene George and Slim are talking and Slim explains how Curly often comes prowling around to see if his wife is around Then, right after talking about it, Curly comes in doing exactly what Slim explained asking for the whereabouts of his wife. George and Slim’s conversation explains Curly’s tendency and it is clarified by him doing it. I feel like that just really gives a layer of comprehension. What really makes this such a good adaptation is that it does not simply take the book and rip it word for word into a play but it is clear that whoever put this play together (in this case, director Anna D. Shapiro) did it with care and a lot of respect for the original novel. I have never seen the film adaptation starring Gary Sinise as George and John Malkovich as Lenny, but to be honest after seeing such an amazing adaptation on stage, I have no desire to. The only reason I did not give this show a perfect rating of 10 is that a few of the actors (mainly James Franco) made a few flubs in dialogue; Although, the flubs were very minor and forgivable. I also realize that this show is still in preview and only began about a week ago, so these problems will all be fixed. Overall, this show is spectacular and is worth an expensive ticket to see. James Franco Becomes Bad Movie Royalty In First Disaster Artist Trailer.